Best Dog Food For Colitis: Reviews and Top Picks! Best Dog Food For Colitis: Reviews & Top Picks! If your dog has bloody stool or strains during a bowel movement, he could have colitis, or an inflamed colon. Colitis can spread between dogs, occur after eating contaminated foods, or be the cause of an allergic reaction to a food. Most dogs with colitis recover completely with the help of medication and a restricted diet. If you are worried that your dog has colitis, take him to the veterinarian as soon as possible. If left untreated, your dog can become severely dehydrated. A simple change in diet can be one of the best ways to combat colitis. These 5 foods are good ones to talk to your dog’s vet about to help treat his colitis. What Is The Best Food For Dogs With Colitis? Fibrous diets will help your dog pass stool more easily. You should also look for dog food that’s low in fat, which can cause constipation. Additionally, look for bland foods, like rice, eggs, and lean white meat, which are easy to digest. It is recommended to refrain from feeding your dog treats while they’re on the mend from colitis. Stick to his regular meals and avoid giving him table scraps. Split his meals into smaller portions more frequently through the day to help him better digest each meal and avoid possible constipation. High water intake for dogs with colitis is important. Water prevents them from getting dehydrated when they have diarrhea from colitis. Your veterinarian may, therefore, recommend a wet diet for your dog, and could even prescribe this Hill’s Prescription Diet. 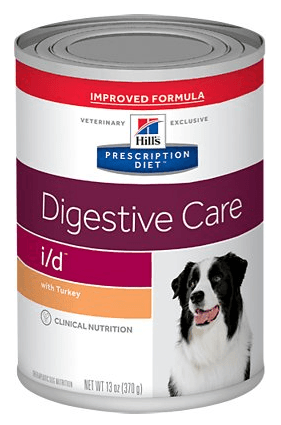 The Digestive Care formula is specifically for dogs who need some help with digestion, so it’s perfect for those with colitis. It has highly digestible ingredients that make up its low protein and fat content. There are also plenty of fibrous ingredients, like rice and whole grain corn. Hill’s adds in healthy antioxidants that promote cell regeneration, which affects the overall immune system. So, on this diet, your dog with colitis can have better digestion while the minerals and antioxidants work to keep him hydrated and fight bacteria. 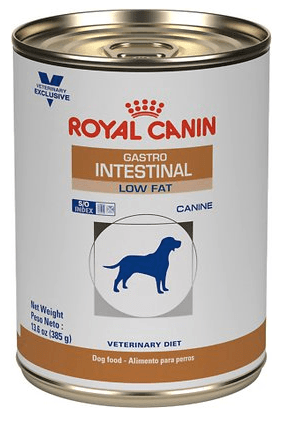 This formula by Royal Canin will require a veterinarian’s prescription, as its fat and protein content are lower than regular diets for dogs. The low-fat diet will help your dog’s digestive tract working optimally, with less risk for constipation and painful bowels. However, it contains the fat content needed to give your dog energy. Using pork-by-products as its main protein, this formula has a highly digestible protein to help keep the digestive system moving. Additionally, you’ll find plenty of fiber from corn grits and corn meal to help regulate stools. Plenty of customer reviews state that this food has quickly cleared up digestive imbalances in their dogs. 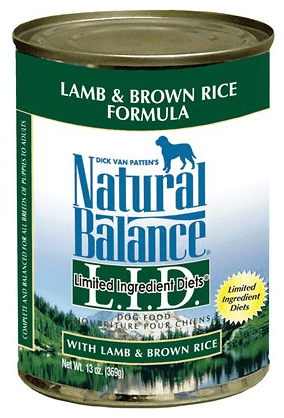 Natural Balance’s Limited Ingredient Diets are perfect for several ailments affecting dogs. For dogs with colitis, I believe this is one of the best canned foods you can choose. This particular formula uses lamb as its main protein, which is one of the most digestible animal meats. And with only 5 main ingredients, your dog is at less risk for allergens and contaminants that can cause colitis. You’ll find lamb, lamb broth, lamb liver, brown rice, and lamb meal as the main ingredients. How much more simple can you get? The fat content isn’t as low as prescription diets for colitis, but it’s much lower than many other foods. 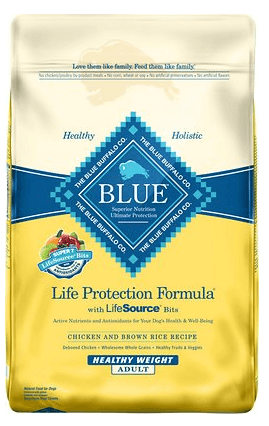 This Blue Buffalo formula for healthy weight for adult dogs is my pick for best dry dog food for colitis. Although it’s not a prescription diet for digestive health, it has many of the same characteristics since it promotes a healthy weight. The formula contains a moderate amount of protein from deboned chicken. Chicken is one of the more digestible meats and it’s a quality protein that can break down easily. The fat content in this food is also much lower than others to help control weight and keep digestion flowing properly. 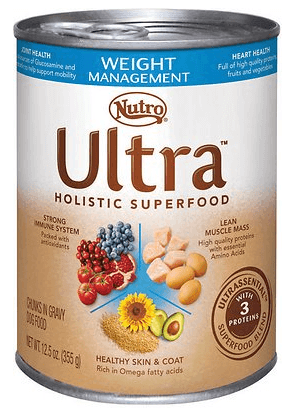 Another weight management formula rather than specifically for colitis, Nutro Ultra Weight Management is still an excellent choice. Nutro is known for its holistic ingredients, choosing only the best for your dog’s food. Better quality ingredients means better health for your dog. This formula uses chicken as its protein, but keeps it at a low amount for better digestion in the body. It is also loaded with vitamins and minerals, which is super important if you’re worried about your dog’s overall health as a result of colitis. This food can help replenish important vitamins and minerals he’s losing in his stools. You’ll also find brown rice and flaxseed to aid the digestive process, and powders from superfoods, like pomegranate and avocado. If your dog suffers from colitis, it can be scary. No one wants to see their four-legged friend in pain or sick. Fortunately, colitis is one of those ailments that your dog can fully recover from. The most important things you can do to help him recover are monitor what he eats, keep him up to date with vet visits, and give him plenty of water. Of course, it all starts with the diet. Try one of my picks for the best dog food for colitis. Making the switch to a low-fat diet with moderate protein content and highly-digestible and fibrous ingredients can get your dog back to his normal life quicker. Make sure to feed him in smaller amounts, more frequently through the day. Ensure that he’s drinking water as often as possible. Additionally, restrict his diet to only his food until he fully recovers. Treats and table scraps are off limits.